For over four decades, one of the longest running mysteries relating the Carry On films was: who was the “Anon” that had sung the theme song over the opening credits of “Carry On Screaming”. Eventually in 2006, Ray Pilgrim, approaching his 70th birthday, decided to own up and confess that it was him. The following originally appeared on the CarryOnLine website. “By April 1966 I’d been “retired” from singing for nearly a year and was deeply immersed in my ‘proper’ career. Then one evening, completely out of the blue, I got a phone call from Eric Rogers. He told me that he needed to set up a very urgent session to record the opening title song for the new Carry On film and needed an ‘experienced, professional session singer who can cut it with the minimum fuss in the minimum time’ and wanted me to do it. I explained that I hadn’t even sung in the bath for months and was really not in the business anymore. He said that they were on an extremely tight schedule, fast approaching the release deadline for the film and would appreciate it if I could come over to his house next day. I was really rather flattered, so I agreed. Next day I took some time off work and drove up to his house and we ran through the music. I thought the words were a bit odd and he explained that it was a spoof horror film. We settled on the overall treatment: The chorus (the Carry On Screaming lines) were to be sung reasonably straight in the style of a band ballad singer, with parts of the verse sung with a bit of emotional quivering vibrato. I can’t really remember, but I don’t think that the falsetto bit at the end came until we were actually on the set when we slipped it in because it felt a more natural lead into Odbodd coming through the mist and Doris’s scream. What I do remember, was that there was no time for any practice or rehearsal because the actual recording session was set up for either the next day or at most a couple of days later. Although the film was made at Pinewood, according to my 1966 diary, the title song was recorded on the nearby Denham Studios sound set. Probably that was because the actual film itself had wound up at Pinewood a couple of months earlier which, by then, was no doubt the home of a new, completely different film. Eric had arranged for quite a large orchestra and the set was full of musicians … plus of course the lady who provided the very important screams during the song. I regret that I don’t remember her name. But I recall she was blonde and very attractive and did a brilliant scream. At one end of the set was a huge screen onto which a silent version of the finished film was projected. I don’t think we had the titles and credits to play and sing to but in my mind’s eye I clearly remember a big clock on or above the screen that rapidly flicked through the fractions of seconds that lead up to the opening scene of the movie. I was used to doing the recording sessions for Embassy in a just couple of takes so I was very surprised that we needed such a large number of takes to do the Screaming film soundtrack, which was really quite a simple song. It wasn’t because we kept on making mistakes or bum notes but because the timing had to be absolutely meticulous with everything exactly to the split second. In fact I found it a bit boring doing the same thing over and over again. But when I eventually saw the finished film I realised why it had to be so exact, with each of the lines of the song and the punctuating screams fitting exactly with the quivering credits on the screen. So that was it. I got paid the princely sum of 27 guineas (excluding any subsequent mechanical use of the recording) … which in those days was not to be sneezed at for a couple of hours work. In today’s money, after 40 years of inflation, I guess it would be worth something approaching £1,000. I picked up the cheque and hurried back to my day job before I was missed! That was my very last professional session, after which I made a complete, clean break from singing so I was more than happy that my contribution to the film was credited as “Sung by Anon”. 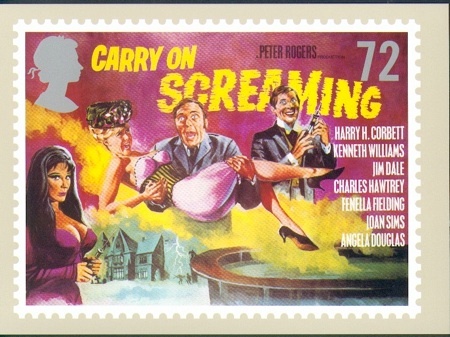 •The “Carry On Screaming” title song as used in the film was not sung by Jim Dale, although he was a professional singer before I ever started in the game and I think he would have made a great job of it. Whenever asked, he always confirms that it wasn’t him. •Boz Burrell did make a record of the song and I believe his record was actually used as part of the various promotional material when the film was released. But it was definitely not the one used in the film as can clearly be heard if you compare the two. •No! It was sung by “Anon” which was me, Ray Pilgrim, which was my professional name all those years ago.